CFF Insider Pro is a friendly custom sans serif corporate typeface for Insider Consulting in Düsseldorf, Germany. 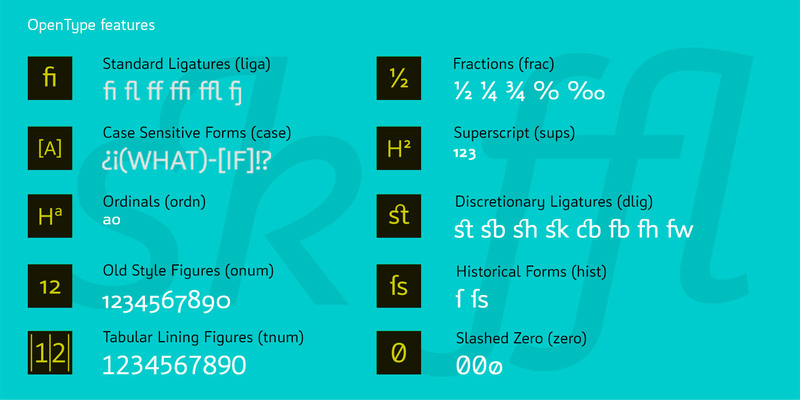 CFF Insider Pro is a friendly and formal grotesk font family. Because of the solid proportions and balanced inner forms it’s pleasant to read at small sizes. It’s made for editorial, identity and logo design but also works well in gutsy display headlines. This Type Specimen CFF Insider Pro contains detailed information about all the features in the fonts, and instructions on how to use them. This Type Specimen CFF Insider Pro is an addition to the basic information on the CFF Insider pro minisite. It contains detailed information about all the features in the fonts, and instructions on how to use them. CFF Insider Pro has a full set of Old Style Figures, also known as non-lining, lowercase, hanging, or text figures, have varying heights and alignments. CFF Insider Pro has a full set of Tabular Lining Figures. All the numbers have the same width and height, allowing them to align vertically in tables, price lists, financial statements and other columns of figures. The subset of the Insider Pro fonts in this family includes all the glyphs listed below. Would you like to receive a PDF type specimen for print? Feel free to contact us and we’ll email you a print-ready document. CFF Insider Pro Medium is forever FREE for you to use! We are working on CFF Trial Fonts that would make it even more practical for you to play around with our fonts. You can buy CFF Insider Pro here from one of our resellers that you like best.